Israel and Jordan have long pursued a common goal to stop the Dead Sea from shrinking while slaking their shared thirst for drinking water with a pipeline from the Red Sea some 200 kilometres away. Geopolitical tensions have stalled efforts to break ground on the ambitious project for years, but the end of the latest diplomatic spat has backers hoping a final accord may now be in sight. The degradation of the Dead Sea, on the border of Israel, Jordan and the Palestinian West Bank, began in the 1960s when water began to be heavily diverted from the Jordan River. "Before 1967, the water was just a 10-minute walk from my house," said Musa Salim al-Athem, a farmer who grows tomatoes on the banks on the Jordan side. "Now it takes an hour," he said, standing amid the resulting lunar landscape of spectacular salt sculptures, gaping sinkholes and craters. "Only the sea can fill up the sea." "Since 1950, the amount flowing in the Jordan has dropped from 1.2 billion cubic metres per year (42 billion cubic feet) to less than 200 million," said Frederic Maurel, an engineering expert at the French development agency AFD. Heavy production of potash, used for making fertiliser, has also accelerated evaporation that has seen the sea's surface area shrink by a third since 1960. Experts say water levels are falling one metre (three feet) a year, and warn it could dry out completely within 30 years. Already 100 years ago, Theodor Herzl, the father of modern political Zionism, had envisaged filling the Dead Sea via a canal dug to the Mediterranean. The sea's natural beauty and mineral-rich black mud have also provided a source of tourism revenue. 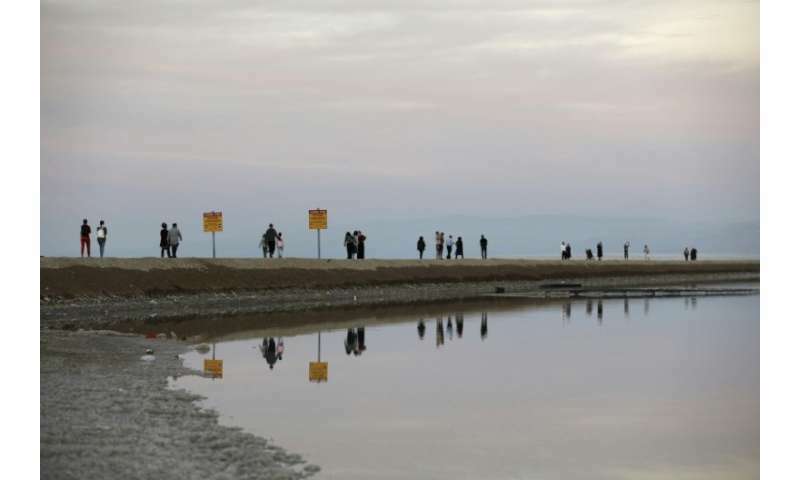 "The Dead Sea has historical, biblical, natural, touristic, medical and industrial values that make it an invaluable cultural, environmental and economic treasure," said Avner Adin, a specialist in water science at the Hebrew University of Jerusalem. After years of studies, the $1.1 billion Red Sea "Peace Conduit" deal was signed by Israeli, Jordanian and Palestinian authorities in 2013. The project, located entirely on Jordanian territory, includes a desalination plant near Aqaba. 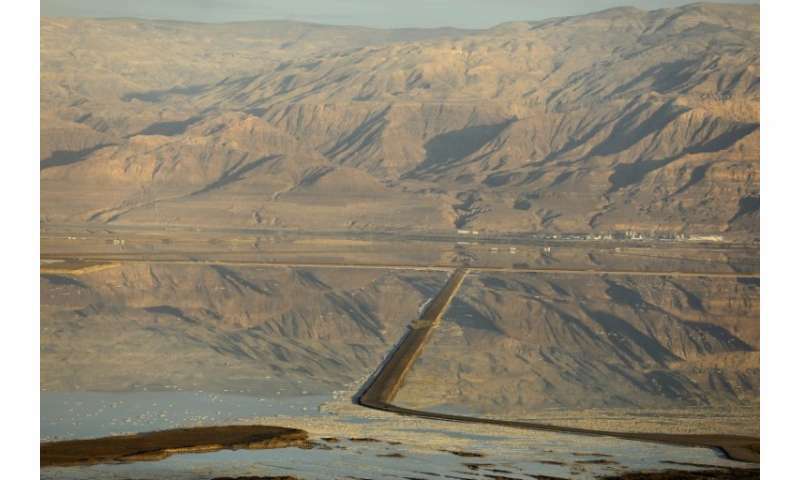 After producing drinking water, the remaining highly saline liquid will be sent by pipeline to fill the Dead Sea, powering two hydroelectric plants along the way. A subsequent 2015 deal would see Israel get 35 billion cubic metres of potable water from the desalination plant for its parched southern regions. The mostly desert Jordan, for its part, would get up to 50 billion cubic metres of freshwater from the Sea of Galilee. Israel also agreed to sell 32 billion cubic metres to the Palestinian authorities. Jordan announced in November 2016 that it had chosen five international consortiums to build the first phase of the canal. But talks on how to finance the deal, which calls for $400 million of public funding, and geopolitical flare-ups have kept the project from moving forward. Some $120 million has already been pledged by donors including the US and Japan, while France's AFD agency has secured the backing of the EU and some member states for $140 million in preferential loans to Jordan. Talks were frozen last year after an Israeli security guard shot and killed two Jordanians at the Israeli embassy in Amman, prompting a diplomatic standoff that ended only in January. "We have never been so close to starting the project," Maurel said. "It only needs a final push by the Jordanian and Israeli authorities." A diplomatic source in Amman said the project remained essential for the region given the environmental and economic stakes, "but it's still at the mercy of diplomatic hazards." For Adin at the Hebrew University, "It seems to be that the situation is improving. The main obstacle in my mind could be financial." 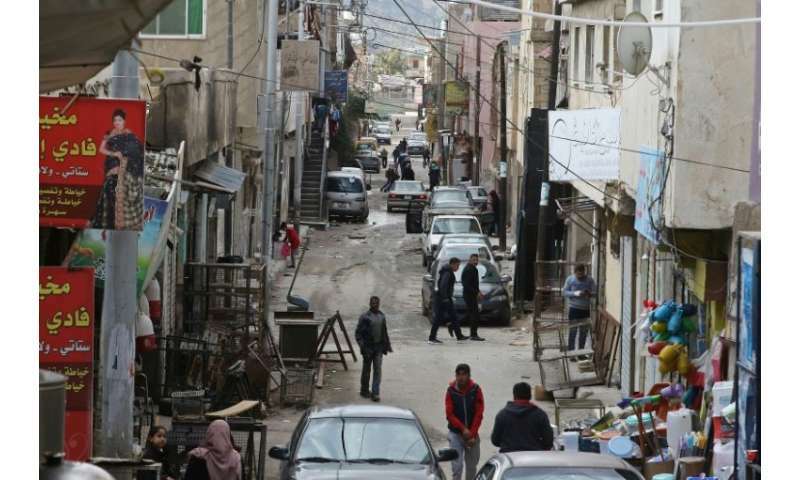 Officials in Jordan say they are determined to press ahead with or without Israel to cope with the needs of a rising population which has been swelled by about one million refugees fleeing the war in neighbouring Syria. "We are proceeding with the project because desalination eventually is the future of Jordan when it comes to water," said Iyad Dahiyat, secretary general of the country's water authority. "Water is part of the stability of the kingdom itself," he added. "It's a national security issue."